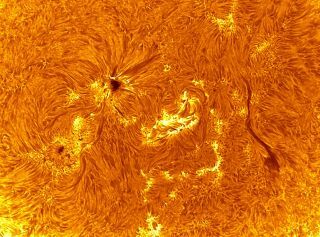 This stunning image give us a close-up look at an active region on the sun. The photo was taken in February combining multiple exposures to collect enough light for an image that would otherwise not be evident to the eye. This stunning image shows a close-up look at an active region on the sun. Taken of active region 1161-62 by Jean-Pierre Brahic in February 2011, the photo is a mesmerizing image of the energy flowing on our biggest star. Solar active regions are areas with an exceptionally strong magnetic field. They frequently host temporary dark patches on the sun called sunspots, and are often associated with solar flares and huge explosions of solar plasma called coronal mass ejections (CMEs) as well. Active regions are assigned by the National Oceanic and Atmospheric Administration's Space Weather Prediction Center. Active region 1161-1162 sent out solar flares on Feb. 18 and 19, creating brilliant flashes of magnetic energy spreading out between the sunspots in the area. These flashes covered a distance equal to about 20 Earths. The powerful flare on Feb. 18 was categorized as an M6.6. Scientists classify the strongest solar flares with a three-tiered system, with C flares being the weakest, M flares intermediate, and X flares the most powerful. M-class flares can cause brief radio blackouts affecting Earth's polar regions, and minor radiation storms sometimes follow them. When such solar storms are aimed at Earth, they can endanger satellites and astronauts in orbit, as well as communications and power infrastructure on our planet's surface. The sun is currently in an active phase of its 11-year solar weather cycle, known as Solar Cycle 24. The cycle will likely its peak period of activity in 2013, NASA scientists have said.